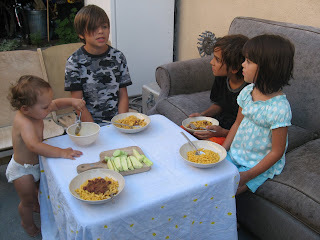 Today we got our feet back on the ground financially with very simple meals. 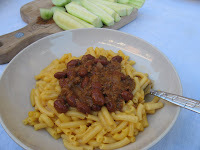 It was cheap cereal for breakfast, egg and bean burrito for lunch with leftover grapefruit slices and birthday cake, it was to be chili mac for dinner with some sliced veggies. Simple. Affordable. But the best parts of the day came to us absolutely gratis. We all needed to let our hair down after yesterdays busy, hot rush. In the late morning as we were doing some organizing in the house, the doorbell rang. It was our neighbors with a huge juicy plate of sliced watermelon. They bought it very afford ably, but it was a 14 pound monster. The three of them couldn't eat it alone. So we had a short but juicy sweet visit with them, all the while enjoying the quintessential taste of summer. The plate was empty by the time we thought to take a picture. 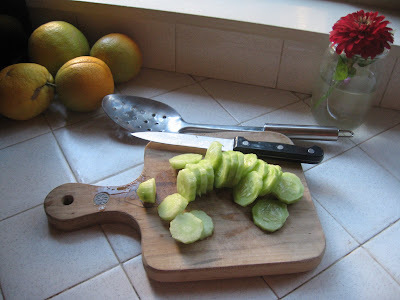 The next simple pleasure was a sliced cucumber (free from our Food Not Lawns friends) at dinner time. It was crisp and sweet and perfect all on its own. It was the first thing to disappear that night. There was a race to the last slice. 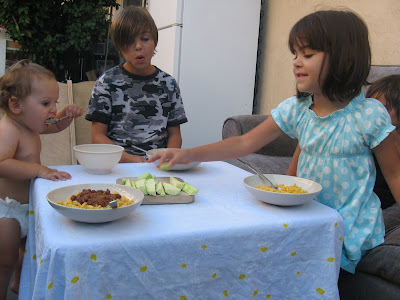 Chili mac, sliced cucumber, zucchini spears and a cool evening. 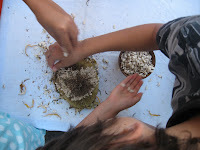 And finally, we enjoyed the group effort of removing the sunflower seeds from that big sunflower head we brought home days ago. It had been propped up on an old wood slat of our fence, drying in the sun since Friday. 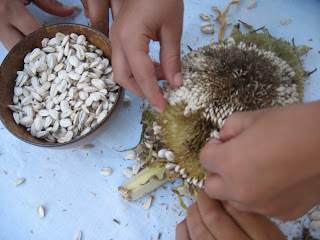 We were all eager to see what sunflower seeds were like straight from the source. 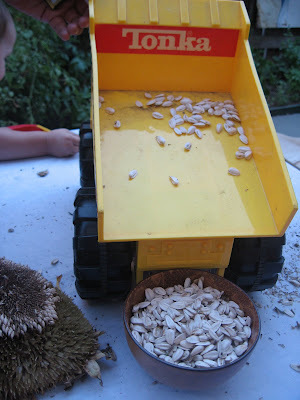 Before washing and roasting we had some fun with the non industrial reality of these home grown sunflowers. It's so hard not to play with your food! Granny Gab is up "late" or "early" as usual. Talked to James tonight. He asked if I had read the blog lately. Yesterday I had tried to log on to no avail. Now I have it in my "Favorites" so it will be easy to find. Love all the great pictures!!! 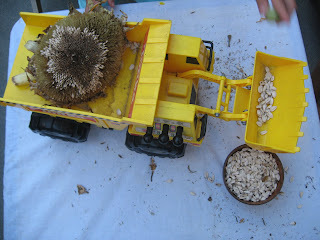 Loved the sunflower!!! 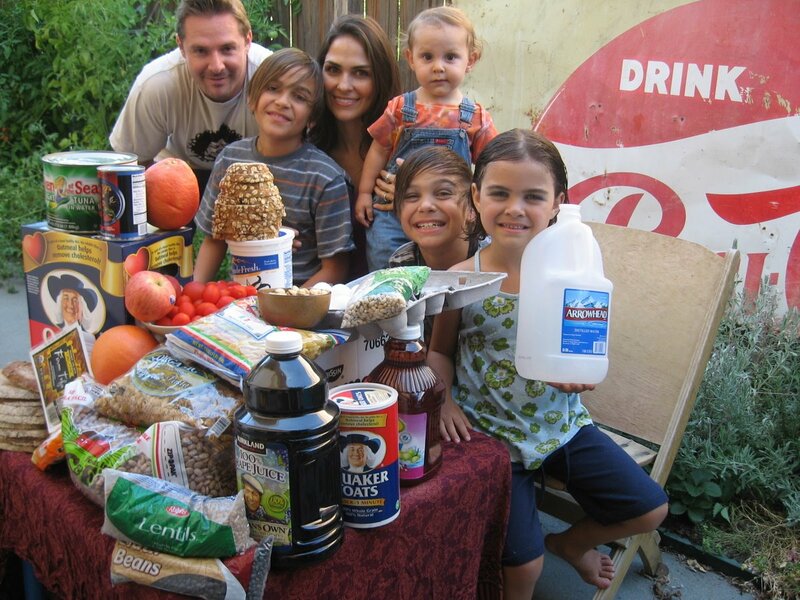 My favorite pictures were of the vegetables, grandkids, James showing the milk and lottery tickets (wonderful smile! ), and Aleli and the grapes! 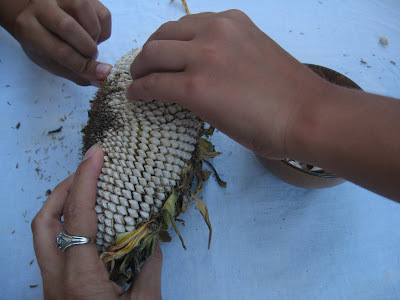 I called my friend in San Miguel, California and read her a portion of the blog. She loved it! She especially liked the part of not having to purchase more lottery tickets!!! I myself, love the lottery!!! In Oregon the lottery, when you don't win, goes to improve the forests, the schools, and fish ladders!!! Yesterday I won $10. on a $3.00 crossword puzzle (my favorite). I purchased one more ticket and got $7.00 cash back. Then I went to Walmart and I purchased milk, bread, bananas, soda, and toilet paper. My bill came to $6.99. I also had one penny left!!! At the store I found a great find in the can room!!! It was a whole basket full! People in Oregon leave cans for other stores in the can room. Cans are 5 cents each. I'm sure I have at least $5.00 worth of cans!!! "They" state that by recycling only ONE CAN it can power a TV for 3 hours!!! Taking ONE DAY AT A TIME makes my fixed income budget go farther. This Saturday I am going to try to get up early and hopefully go to bed early so I can go to the fruit and vegetable stand. The Oregon Senior Farm Direct Nutrition Program sends out $30 worth of coupons to use once a year. When I first moved here almost 5 years ago (5 years this coming October 31st! )it was $80. They cut it down a lot! They stated the reason was people weren't using their coupons!!! Last year I purchased some great tomatoes from the stand. 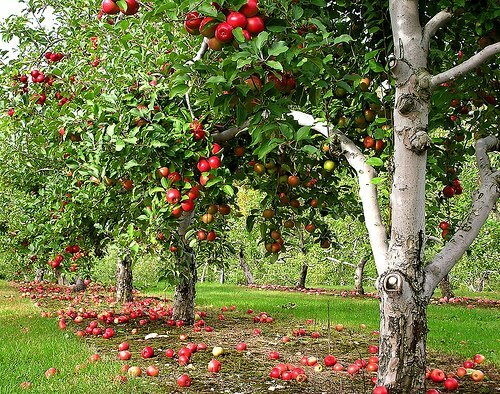 They were grown in Roseburg, Oregon. Best tomatoes in town!!! Tomorrow is Bi-Mart day!!! On Tuesday they post the card holder numbers and you win prizes! In the past year I won a broom, some mints, some tea, and some other things. One person I know won a TV!!! They have some great prizes! At Christmas they give $100 gift certificates instead of the prizes. Hopefully by this Christmas I will be living in wonderful Arizona. Oregon is great this time of year but toooooo cold in the winter! I was thinking that your blog would make a great radio program! It would also be great for TV!!! Years ago, before TV, when I was sick I would listen to some wonderful radio programs. They had continuing stories and you would keep tuning in the next day.